How to reset oil service light Nissan Altima. From years: 2005, 2006. You can set the engine oil and the tire rotation interval. 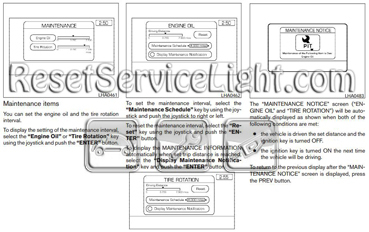 To display the setting of the maintenance interval, select the Engine Oil or Tire Rotation key using the joystick and push the ENTER button. To set the maintenance interval, select the Maintenance Schedule key by using the joystick and push the joystick to right or left. To reset the maintenance interval, select the Reset key using the joystick and push the ENTER button. To display the MAINTENANCE INFORMATION automatically when set trip distance is reached, select the Display Maintenance otification key and push the ENTER button. the vehicle is driven the set distance and the ignition key is turned OFF. the ignition key is turned ON the next time the vehicle will be driving. To return to the previous display after the MAINTENANCE NOTICE screen is displayed, press the PREV button. Display Maintenance and Notification is set OFF. the maintenance interval is set again. HOW TO USE THE TRIP BUTTON Nissan Altima. When the TRIP button is pushed, the following modes will display on the screen. Warning message (if there are any) ! TRIP 1 (Elapsed Time, Driving Distance, Average Speed) ! TRIP 2 ! FUEL ECONOMY (Average Fuel Economy, Distance to Empty) ! MAINTENANCE (Engine Oil, Tire Rotation) ! OFF. Trip 1, trip 2 and fuel economy items Nissan Altima. To reset the TRIP 1, TRIP 2 and FUEL ECONOMY, select the RESET key using the joystick and push the ENTER button or push the TRIP button for more than approximately 1.5 seconds. 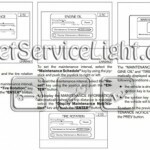 The full procedure how to reset oil service light Nissan Altima is taken owners manual. How do you reset oil service light Nissan Altima. From years: 2007, 2008, 2009, 2010, 2011, 2012. 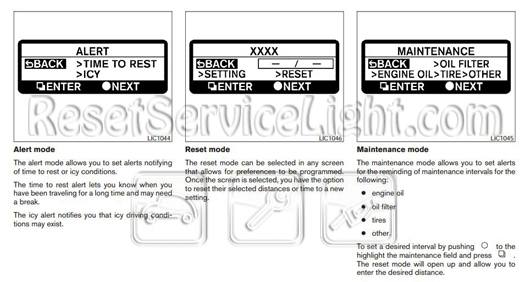 All information how to reset oil service light Nissan Altima is taken owners manual. 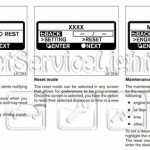 That it is the full procedure how to reset oil service light Nissan Altima. If you like to reset any maintenance oil light after an oil change. Or reset check engine light, airbag light, inspection key or insp errors when maint reqd, for Nissan cars. Or any warning light for service reminder which appears on the display. Write in the search box the car name for which you want to find information, and find how to reset other service reminders when by yourself. This was helpful but I brought my car used last 3 months ago. I take it west virgania and Maryland. When I brought the car it had 92, plus mile change the oil and the maintenance light with a man picture so I check other 3000 3000 on it so I have no idea what it means. Can you help me to understand. Thank you in advance. Hello Melissa, please tell me more about your car, when was made and the model. How do you reset the change oil / filter light on a 2015 Altima ? Hello benito, your Nissan is fifth generation, our procedure works until year 2012.